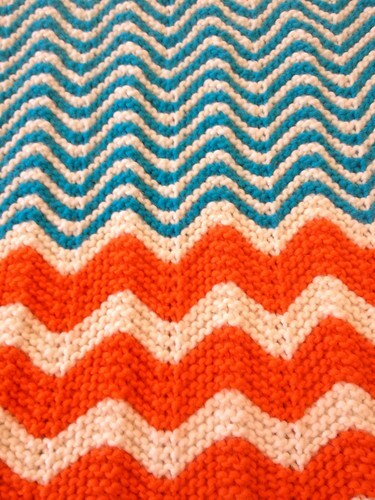 I came across this post on the Purl Bee and I fell in love with the Chevron Baby Blanket. 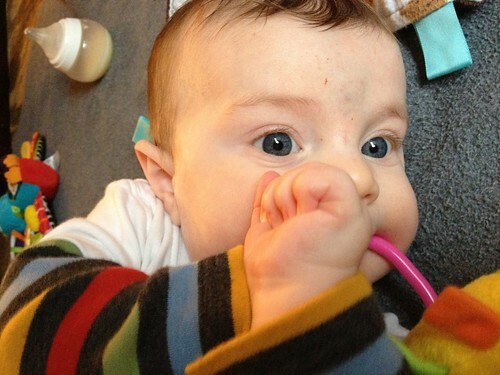 So I hopped on over to Purlsoho.com and ordered my own color combination for my friends' son, Ben. Yarn: Purl Soho Super Soft Merino- 4 skeins Heirloom White, 1 skein each- Timeless Navy, Extra Green, Clementine Orange, and Dragonfly Blue. Comments: I had to order 1 extra skein of Heirloom White. That slowed progress a bit. This yarn is super, super soft and fluffy. 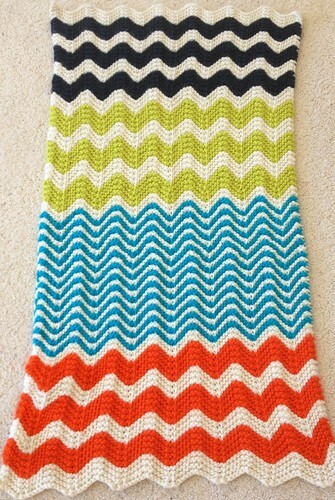 It made a warm blanket that will be perfect for a Boston baby. Although the sell kits with different color combos, I really love the colors I picked. It's preppy and nautical without being too serious. I'm especially loving the bright blue/orange combo. Now I just have to get it in the mail to the baby boy. 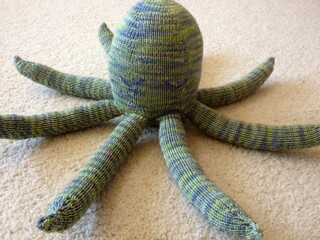 For his first birthday, I decided to knit my nephew Silas an octopus. 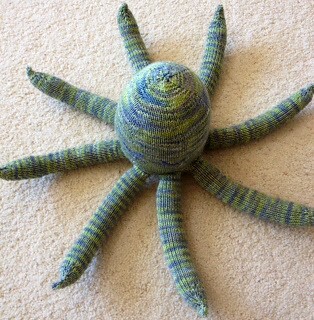 Did you know you have to knit 8 legs?!?!??! That's a lot of legs. But it did turn out really cute. But damn that's a lot of boring legs to knit. I hope baby Silas loves him a lot- even though he is a month and a half late. Last July 1, my nephew Silas was born. 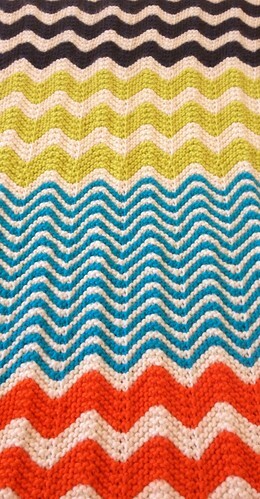 And I finally finished his baby blanket. I love this pattern. It's quick, beautiful, and easy to memorize. Mods: None. Although, I ran short of yarn for the bottom border. So that end has a little shorter edge. I'm pretty sure he won't notice. 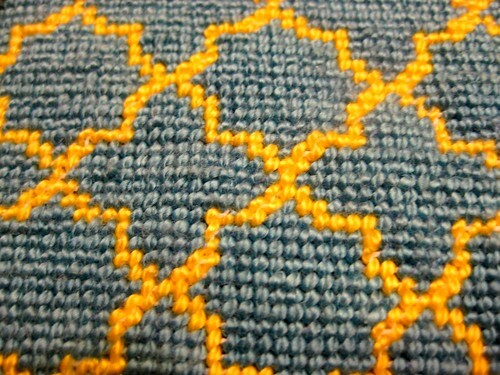 Here's a close up of the stitch pattern. Love it. Now I just hope it doesn't take me another month to mail it to them. I have to confess... I've been cheating on my knitting. But when I saw this post on Alicia's site, I couldn't resist. Of course, I bought the kit and furiously dove in. Then, in typical Nell fashion, I got distracted by knitting and it took forever for me to just finish the damn thing. Here's how mine turned out. Now it just needs to be ironed and framed. But that'll take me another 6 months. I really do hate finishing! I thought this post needed some Olympic attitude! For the fifth knit from Wendy Johnson's Toe Up Socks for Everyone, I finished the Victory Socks. Mods: None. But this is the first pair I knitted 2 socks at a time on 1 magic loop needle. It went pretty smooth although I had a yarn tangle at the end! 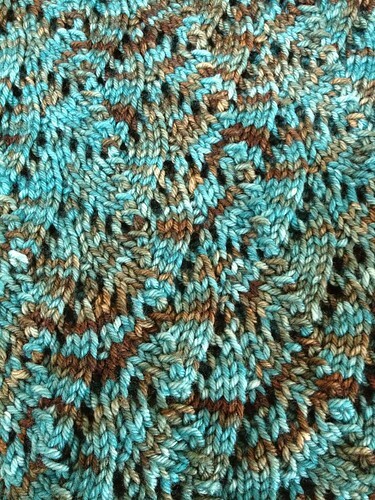 This pattern was really fun to knit I just got derailed by all the baby knitting I've had in the past few weeks. They really should not have taken so long. Love them! And I really love the Scout's Swag yarn. Her color sense is amazing. The purples flow so beautifully. It seems like every year, I'm smack dab in the middle of a baby boom. And this year is no different. 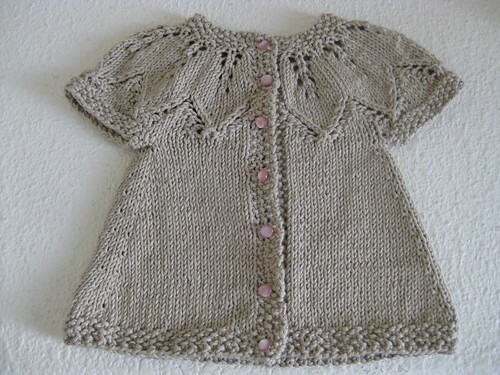 There are at least 7 babies I need to knit for this year. 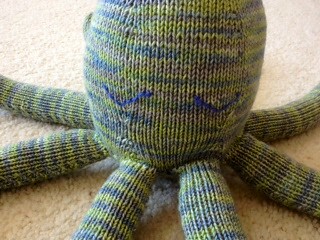 Date Finished: 5/6/12- The knitting was done about a month ago. In typical fashion, it took me forever to sew the buttons on. Mods: None. 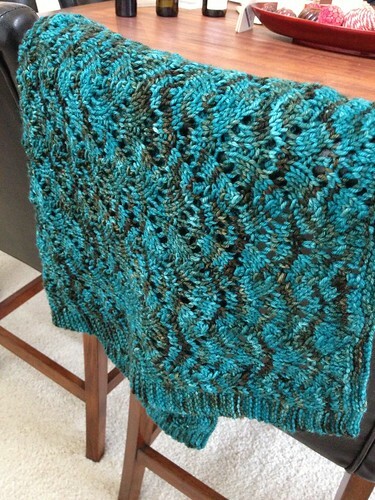 I really knit this as a trial run but I think it's good enough to give as a gift. 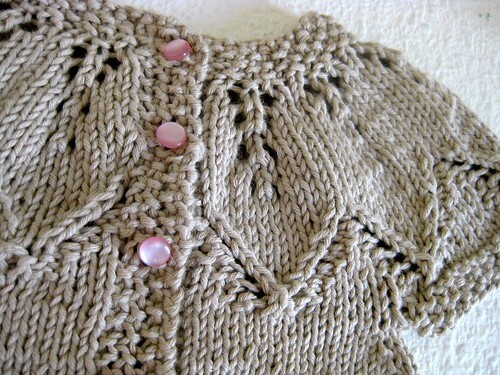 I love the pink buttons. It makes it sweet but not too girly. I'm thinking this one is a hit. Long time, no blog. Between Facebook and Pinterest, my computer time has been sucked up. But I had a couple of things I wanted to show off. 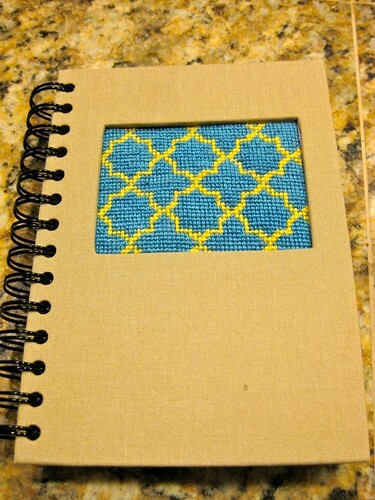 I've had a needlepoint notebook kit for years. Last Sunday, it called to me from the craft closet. I happily stitched away while watching a DVR marathon of Smash and House of Lies. 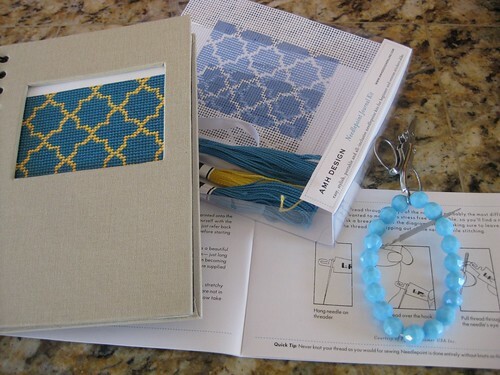 The kit came with everything you need to make a gussied up notebook. Thank goodness it came with instructions. 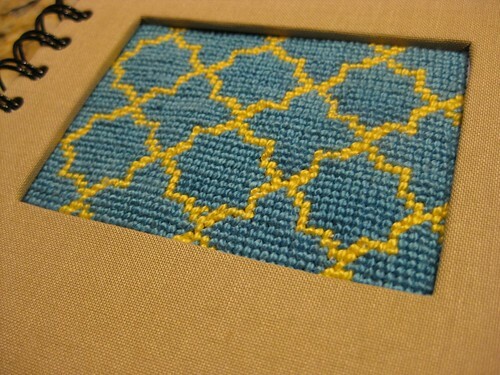 I haven't done needlepoint in quite a while. After about 3 hours I had this piece. And you get a finished project. A fun and easy lazy Sunday project. But now it's almost too nice to use. Isn't that always the way. 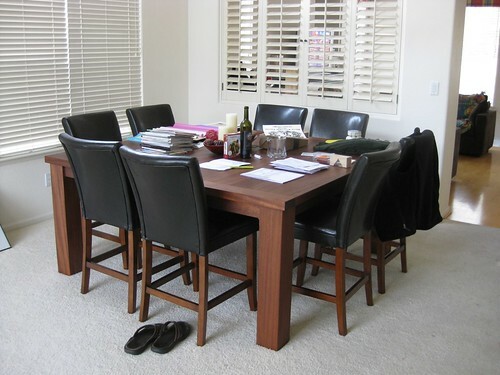 You might remember that we had a dining room table custom made to fit our space perfectly. It's beautiful. However, we had it made too tall for normal dining room tables. But it's a little too short for counter height chairs. Kinda silly, right? So we've been using cheap folding chairs that were really too short for a couple of years now. They were so short we had to put Grandma on a phone book for Thanksgiving! Yesterday, Brian brought home our new "real" chairs. They are about an inch too tall. So eventually we'll have to cut the legs down. 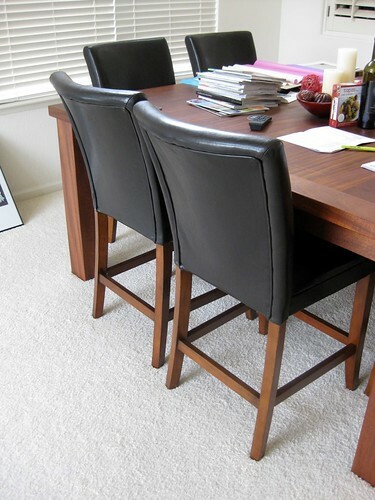 But they look 1,000 times better than the cheap folding chairs did. It's very masculine. The rest of the room will have to be a little softer so that it balances out. I should have cleared the table off before I took pictures. 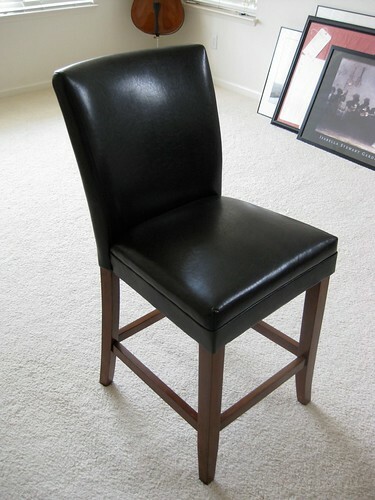 Here's a single chair. The leather is actually really dark brown. And somehow the wood matches our table perfectly. Now we just have to have a dinner party to show them off!